Our reference librarians have created LibGuides (web pages) with helpful suggestions on sources and search strategies for various topics and sources by department. You can ask your liaison librarian to create a guide to support a research assignment in a specific course. 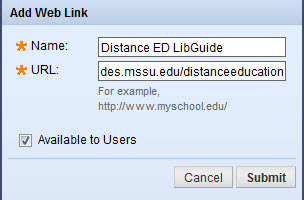 Find existing guides by going to the LibGuides homepage and following the links to your discipline to select a guide. Adding a guide to your Blackboard course works best if you have a specific guide title in mind to use, either one created by your librarian specifically for your course, or one of the generic guides to a subject. 5. In the form that opens, type the name of the LibGuide, paste the guide URL, add a description, select other options as desired, then click, Submit. 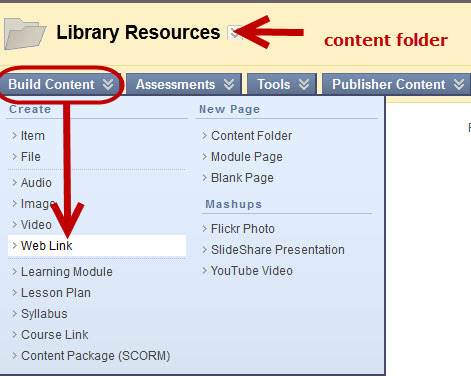 The link should now be available within the content folder to which you added it. 5. You are done! You should see a link in your course menu with the name of the LibGuide. 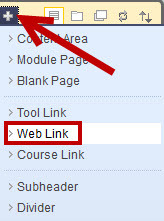 Clicking on the link should result in the LibGuide opening within your Blackboard Course Site.